The Pompey History Society looks back on what was making the headlines in the Sports Mail on December 22, 1984. 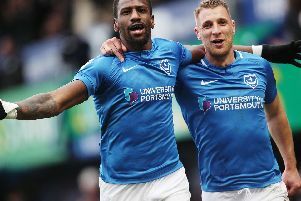 Two thundering headers by Alan Biley in the last seconds of a pulsating top-of-the-table clash against Oxford United earned Pompey victory in front of 22,446 at Fratton Park. Kevin Brock gave Oxford the lead in the 68th minute, nipping in behind the Pompey defence to sweep the ball home. With time running out, Neil Webb crossed for Biley to head in at the near post. Then, in time added on for a pitch invasion by a full-rigged Father Christmas, Biley rose to head Mick Kennedy’s centre past Steve Hardwick for the winner. The drama was still not over as Billy Hamilton shot against the Pompey crossbar. Pompey: Alan Knight, Gary Stanley, Mick Tait, Kevin Dillon, Noel Blake, Malcolm Waldron, Neil Webb, Mick Kennedy, Nicky Morgan, Alan Biley, Vince Hilaire. Oxford: Steve Hardwick, David Langan, Bobby McDonald, John Trewick, Gary Briggs, Malcolm Shotton, George Lawrence, John Aldridge, Billy Hamilton, Trevor Hebberd, Kevin Brock. Tottenham Hotspur moved to the top of the first division after beating Norwich City 2-1 at Carrow Road, with the goals coming from Garth Crooks and Chris Galvin. Manchester United’s 3-0 home victory over Ipswich Town put them second in the table. The morning’s leaders, Everton, were beaten 4-3 by Chelsea at Goodison Park. Strikes from Danny Wallace and Joe Jordan, along with a Tom McAllister own goal, helped Southampton to a 3-2 victory away to West Ham United. Steve Walsh, of Wigan, was sent off in the 44th minute at Rotherham in a division three fixture. It signalled protests from both teams and the referee Tom Jones ordered Wigan manager Harry McNally out of the dug-out. The King’s Theatre was to sponsor the match ball between Pompey and Fulham on New Year’s Day – with a bonus for fans. Anyone attending the King’s pantomime the next day could receive a 50p reduction by producing the match-day programme. Gareth Williams, former Welsh international rugby union forward and Bridgend captain, had to be replaced before he even started his club’s match at Cardiff. Williams, who needed stitches above his right knee, was replaced in the back row by Simon Bryant, with Mark Titley taking over the captaincy. At least five people were killed and several others seriously injured when an articulated lorry jack-knifed across the central reservation on the M27 near Southampton.